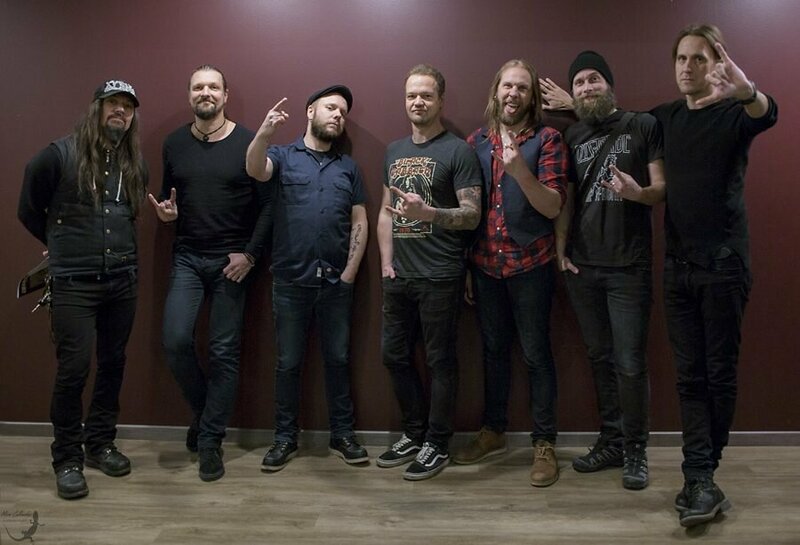 Amorphis have been featured on our site on numerous occasions before, but February 24th, 2018, was a very special day to write about, as Musicalypse had been invited to the listening session of the Finnish metal veterans’ 13th studio album, Queen of Time. The preceding record, Under the Red Cloud (2015), had been well-received by all of us, so naturally we were excited to hear where the band would go musically on its successor. Interview with Tomi Koivusaari and Olli-Pekka Laine coming soon! We arrived at the Sonic Pump Studios a dozen or so minutes before the scheduled 15:00 beginning. Having admired the gold discs and framed photos on the walls and caffeinating ourselves sufficiently, we sat down in the room where the album playback was to take place. The event began with lead guitarist Esa Holopainen and producer Jens Bogren giving a little introductory speech. 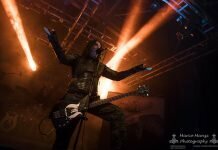 Bogren teased Holopainen for not looking excited enough – “I am excited, but I’m Finnish!” the guitarist said in his own defense. Bogren also proclaimed that we would see a lot of names in the credits once the album comes out, as they had worked with musicians from Turkey, an Israeli choir, as well as “a drunk Pakistani flutist.” Finally, the long-awaited moment arrived and the ‘play’ button was pressed. A synth intro accompanied by ethereal female vocals leads us into the world of Queen of Time. The delayed guitar riff reminds me a bit of “The Way”, but the backing instrumentation is much more intense here. 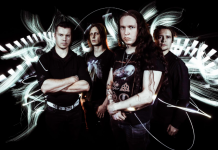 The growled oriental verses are typical heavy Amorphis, but there’s also some very gentle singing from Tomi Joutsen in the song. Nice start! The Police wrote “Message in a Bottle”, but Amorphis relies on amber instead. The folky riff and the calm verses where Joutsen sings in two octaves lead me to believe that this song might even become a single like previous track #2s, such as “House of Sleep” and “Silver Bride”, but suddenly the growled chorus kicks in and I’m proved utterly wrong. The song takes unexpected turns, but that’s a positive thing. Prog time! Over the course of just one song, Amorphis offers us a 7/8 riff, a chorus with fierce black metal vocals, a saxophone solo, and a warm, jammy middle section where lyricist Pekka Kainulainen recites a poem in Finnish, among other things – to say there’s a lot going on here would be an understatement. A very likely favorite for myself, and perhaps for many other fans as well. Tinkling synths and wordless female vocals open the tune, which also boasts a catchy riff and a big chorus. In the middle there are strings building up the drama, as well as a solo played on an exotic string instrument. As an extra curiosity, the album title is namedropped a few times in the lyrics. I have a feeling this is going to be another popular song among listeners. The riff at the beginning recalls “Reformation” from 2011’s The Beginning of Times, and there are some big percussions accentuating the sound. “I should’ve understood / I should’ve seen it coming,” Joutsen sings in the infectious chorus, and in the fascinating middle section his voice has been run through a Vocoder or a similar robotic effect. There’s only a bit of growling at the end, and the massive outro reminds me of “Nemo” by Nightwish. Mark my words: this will be a single! A fragile guitar melody gives off a feeling of lonely melancholy, before giving way to a riff with a pace that makes me think of “School’s Out” by Alice Cooper; that is, until the drums come in and I realize I’ve been hearing the rhythm wrong in my head. What makes this song stand out is the chorus, where Joutsen growls in a very rhythmic, punishing manner, and at the end he’s backed by a choir to drive the point home even more emphatically. I could see this becoming a setlist staple! There’s a bit of an “Escape” vibe on this one, and to be honest, it comes across as a bit of a filler, at least in comparison with the previous songs. I feel like more clean singing would fit this kind of tune better, as it’s not that dark or intense. That said, there’s an intricate folk riff that recurs multiple times in the latter half, and Santeri Kallio’s impressive keyboard solo is something to look out for as well. The song starts off with sitar and a guitar melody that reminds me of Finnish rautalanka music, but that doesn’t last long, as the rest of the track includes some of the most pummeling riffs on the whole album. The interesting chorus includes a trade-off between clean and growled vocals, which makes me wonder if there’s a Joutsen/Koivusaari duet to be expected in case it gets played live. Speaking of duets, this is one, between Joutsen and Anneke van Giersbergen herself. When a singer as prolific as her makes lots of guest appearances, the danger of inflation is always present, but luckily the results speak for themselves, as this may just be the highlight of the entire album. Musically, this feels a bit brighter than most of the other songs, and the final climax is particularly splendid. Tomi Joutsen’s growls in the first verse are some of the grittiest and harshest he’s ever let out – possibly something he learned from the Hallatar sessions? There’s a lot of variety in this song, which is probably why it didn’t totally manage to click with me yet, but the big ending riff, emphasized by an orchestra and church organ, is an apt conclusion for the album in all its grandness. Compared to the main album, this track has a more relaxed and sparse 70s vibe: waltz beat, harmonized guitars, clean strumming, Hammond organ… an enjoyable song, but it’s easy to see why it ended up on the cutting room floor. The delay guitars give the verses an “Alone”/”Sky Is Mine” feel, the chorus is catchy, and Holopainen’s guitar solo is brilliant. A good tune, just like the previous one, but being rather straightforward and more in line with earlier Joutsen-era albums, I totally get why it didn’t fit in either. My first impression was very positive, and I actually got a bit of a The Beginning of Times vibe, though not as much from the music itself (although I did namedrop a few tracks from that record above) as the approach of the album. TBoT aimed for cinematic and epic sounds with songs like “Crack in a Stone”, and it also featured symphonic keyboards, female vocals, and various extra instruments, but on Queen of Time, the epic elements have been pushed boldly to the foreground and the result is more focused, which makes the album feels like a significant step forward in the band’s evolution. The instantly recognizable Amorphis recipe is still in use, but it’s been spiced up quite a bit. It’s impossible to tell how Queen of Time stacks up against the rest of the Amorphis discography based on just one listen, as it’s by far the most challenging and least accessible album of the Joutsen era. If there’s one Amorphis record that requires time to sink in properly, it’s this one – as Bogren warned us beforehand, there’s a lot to digest. There are both clean and growling vocals, and lots of layers in every song, as well as few simplistic tunes or immediate hits to be found; however, further listens will surely be rewarding and unveil a lot of previously missed details. In any case, it’s evident that the boost that Bogren gave the band on Under the Red Cloud wasn’t just a flash in the pan, as their collaboration continues to be fruitful!